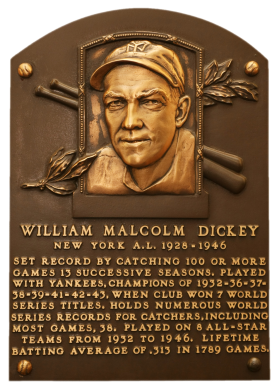 Catcher of 100 or more games for 13 consecutive seasons, in 1936 Bill Dickey hit .363, still a record for the position. He accumulated a .313 batting average and 1,209 RBI in his career. During his 17 years, the Yankees won nine pennants and captured eight world championships. Dickey is credited with developing the receiving skills of another Hall of Famer, Yogi Berra. Comments: NM card with strong corners and terrific centering. For a long time the 1940 Play Ball set was represented in my collection by a PSA 8 Nap Lajoie. After deciding to diversify the collection a little, I replaced the card with a E95 Philadelphia Caramel. I looked through the collection to see which HOFer could be switched to now cover the 1940 Play Ball set since I didn't have any other examples. I had a 1941 Play Ball Vaughan as well as a Bill Dickey. So, I had found the perfect candidate. 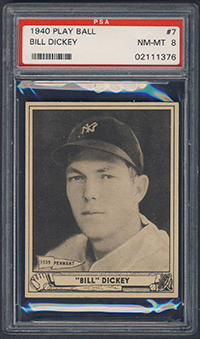 I had upgraded the Dickey several times (PSA 4 purchased in Oct 2002, PSA 7 purchased in May 2004) and it shared the exact same image with the 1940 Play Ball card. 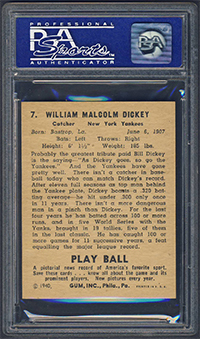 So, I sold the 1941 Play Ball Dickey and replaced it with a PSA 4 1940 Play Ball example in Dec 2006. It was upgraded to a PSA 6 in Feb 2007 and finally upgraded again with a PSA 7 example in June 2009. I've been trying to find a PSA 8 example - up high on my wantlist. UPDATE: It was late in the evening on St. Patrick's Day 2015 and we were flying to Florida for a family trip early in the morning. The kids were in bed and we managed to also lay down by 10 PM. I was tired but my adrenaline kicked in and with it a second wind. I was pretty excited about our first extended vacation in three years and couldn't fall asleep. So I do what I always do when I can't sleep and visited eBay with my iPhone. 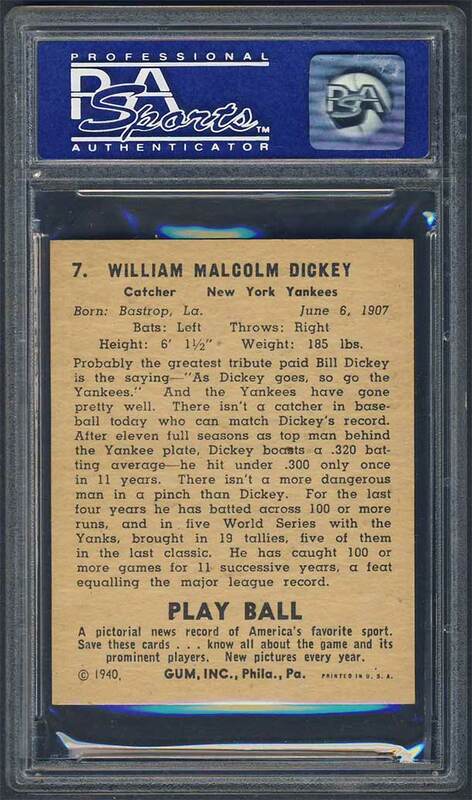 I was executing each of my saved searches and one of them kicked back this beautiful PSA 8 Dickey. It had a Buy It Now price above the SMR price guide but still reasonable imo based on the relatively low population (ten 8's, one 9). The centering was nice but the borders looked a little narrow. I quickly checked it against other '40 Playball images and it looked legit. I was afraid someone else was going to grab it out from under my nose so I returned to the site and clicked the BIN button. The upgrade was mine after a long wait of six years. Description: Following the success of its initial effort in 1939, Gum Inc. issued a bigger and better set in 1940. The 240 black-and-white cards are once again in 2-1/2" X 3-1/8" size, but the front photos are enclosed by a frame with the player's name. Backs again offer extensive biographies and are dated. A number of former stars were issued along with contemporary players, and many Hall of Famers are included. The final 60 cards of the set are more difficult to obtain.